The Pilg's first reaction on seeing this release was 'It's been done before'. You see, it's such an obvious idea once you think of it: to parody the Great Original itself. But the fact is that no-one has ever done it before! So full marks to St Brides for trampling over another of our sacred cows, and thank you to CRL for putting it before the public. 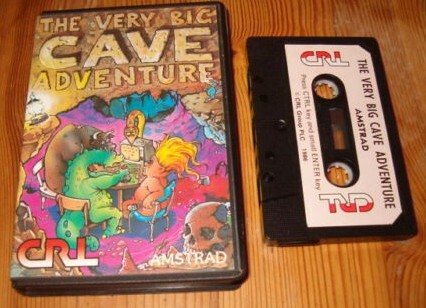 The Very Big Cave Adventure is actually a very serious academic look at the Colossal Cave Adventure, first programmed by Crowther and Woods using 170K of Fortran code on a mainframe computer. The game has already been the subject of much in-depth, study by many adventurers, but now St Brides have taken the ingenious step of actually providing you with a guide to the caves, Trixie Trinian, who takes you by the hand and leads you through the adventure. Trixie certainly knows her stuff. She takes you first to the little brick building by the stream, where you find your wellies keys, and other assorted items for the forthcoming journey. If you try to carry too much, she politely makes this clear to you ("You're carrying too much already, wimp") and she is of great help with, the bull that appears to be reluctant to let you down into the caves. Certain of the underground caverns have not, in the Pilg's opinion, been given the airing they deserve, but St Brides have changed all that. The Space Invader Room, for example, is given a new and definitive treatment - most adventurers will never have seen it before, but here it is in horrible technicolour you can move left, right, and fire. At its worst The Very Big Cave Adventure is so bad it's funny, and at its best it's hysterical. It's certainly worth every penny of £7.95. The graphics are excellent and the text descriptions are almost up to the standard of the original. I'll leave you with this brief extract from the beginning of the game, where the bull won't let you pass: "Are you still there?" roars the bull guarding the gully. "No", you reply, whereupon he lets you through because, you see, he's GULLY-BULL.